If you are looking to escape in complete luxury, look no further than Tigers Eye, an exceptional 4 stateroom 2008 Hargrave 98 Skylounge motor yacht. Designed specifically with you in mind, she offers every amenity of a yacht twice her size. Her three deck design includes:the upper deck, with sky lounge helm station,large outdoor entertainment area with sun deck and Jacuzzi; main deck with full beam salon, dining area, country kitchen; and lower deck with four cabins - luxurious master, VIP, two twins (one converts to double) and two separate crew cabins forward. Tigers Eye is a great example of the Italian inspired Hargrave Capri series. Her smooth lines and contemporary styling produce an inherently European look with the benefit of the impressive design features common to the Hargrave line. The expansive salon and large galley with dinettemake for a family friendly vessel, andfour guest cabins,twocrewcabins,spacious aft deck and sundeck make her a great candidate for charter. All 6 cabins have ensuite heads with stall showers. There are additional day heads on the main deck, sky lounge and swim/work room accessed from the swim platform. United Yacht Sales New Jersey would love to guide you through a personal showing of this 98' Hargrave Skylounge 2008. 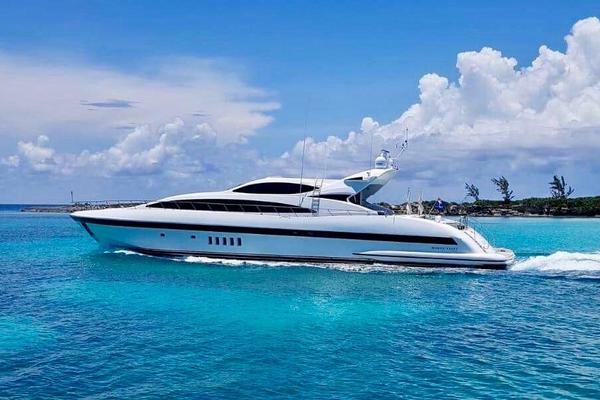 This yacht for sale is located in Fort Lauderdale, Florida and priced at $3,950,000. For a showing please contact us by filling out the form on this page and we will get back to you shortly! Forward of the salon is the formal dining area for eight guests with attractive hutch with drawers, glass doors and lighted shelves. Between the dining area and the galley is a sliding pocket door with a large frosted glass panel. This provides privacy for more formal dinners while retaining the feeling of openness that characterizes Tigers Eye. A counter divider with teak columns between the salon and dining area enhances the luxurious design. The main deck day head is conveniently located forward of the salon and aft of the galley, next to the staircases to the skylounge and lower deck cabins. The foredeck is ideal for sunbathing on the luxurious tanning pad and comfortable recessed seating. To shade the foredeck, a large umbrella can be set up when anchored or moored. The anchor windlass and chain locker lie fully forward. Master StateroomFrom the main lower deck hallway one enters the master stateroom through double doors. The impressive king sized four poster bed with canopy is the centerpiece of the full beam cabin. A love seat is provided to starboard and two large stainless hull opening ports port and starboard. Multiple hanging lockers and wide bureau provide excellent storage. The ensuite facilities include two bathrooms and large stall shower. All floor and wall surfaces are finished in polished granite.VIP CabinAt the forward end of the hallway one enters the VIP cabin with queen berth. The stateroom has en suite facilities finished in granite, plenty of storage and individual climate controls. Stateroom also includes an entertainment system with 25" flat screen TV.Guest Stateroom 2Twin stateroom to starboard with capability to convert into Queen stateroom. Stateroom has ensuite facilities finished in granite, plenty of storage, and individual climate controls. Also includes an entertainment system with a 19" flat screen TV.Guest Stateroom 3Twin stateroom to port with two single berths and an additional pull down third berth. Stateroom has ensuite facilities finished in granite, plenty of storage, individual climate controls and entertainment system with a 19" flat screen TV. Forward crew quarters and lounge have their own stairway down from the galley. Includes centerline queen cabin and upper and lower berths in second cabin. Both have en suite heads with stall showers. Curved settee and dining table in the lounge. Tigers Eye's upper deck is accessed from an interior circular staircase to the skylounge and stainless framed teak steps from the aft deck. The skylounge includes a plush, carpeted lounge area with custom curved couch with cocktail table, Sony 40" pop up HD plasma TV, wet bar with seating and Sub Zero stainless refrigerator/icemaker combo. The helm station is forward with impressive instrument console and varnished teak cabin sole. Includes Cat instruments at helm (Tach/Oil Pressure/Engine Temp/Trans Pressure/Hrs) , 2 Stidd Low Back Admiral Chairs COM #500-200-1 helm and passenger seats.In the aft starboard corner of the skylounge adjacent to the automatic doors to the sundeck is a day head with direct access from the skylounge or sundeck. The sundeck aft of the skylounge is sufficiently large for a bar with barbeque, 6 person hot tub (American Whirlpool) with perimeter seating, open air settee with dining tableand yacht tender storageand davit. Comfortable cushioned seating around a dining table and the base of the Jacuzzi are perfect for cocktails under the stars. The experience Hargrave garnered as a leading design and engineering firm over the previous 35 years has been put to good use in building Tigers Eye. That depth of experience has produced an intelligent design that performs well, with open floorplans that are truly creative and deliver a higher volume interior than most of Hargrave's competitors. Hargrave has a well-earned reputation for excellent service and outstanding quality, ensuring Tigers Eye's future owner's value is protected and support is ongoing. 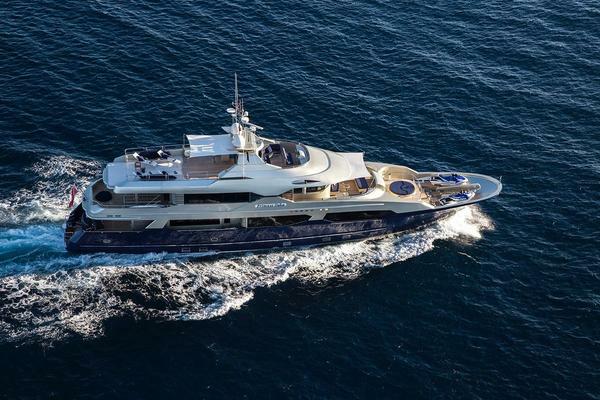 No company has had more repeat clients, which represents a large portion of Hargrave's new builds.In the summer of 2012 Tigers Eye was hauled at Roscioli's yard in Ft Lauderdale. The engine cooling systems were serviced, including the intercoolers, after coolers and heat exchangers. The propeller shafts were pulled and all bearings replaced. Two new shaft seals were installed and the zincs were replaced. The bottom was cleaned, sanded and repainted.An inspection will confirm Tigers Eye has been maintained to the highest standard.Her varnished cherry interior designed by Shelley features exquisite soft goods. Everything is on board Tigers Eye for family cruising or charter, and her current replacement is approximately $2,500,000 more than the $4,995,000 asking price.